Successfully Added High-Def Media Server with HDMI - Wireless Media Streaming to your Shopping Cart. 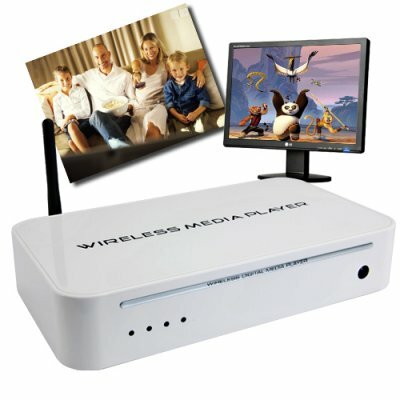 Digital media server with UPnP for wired or wireless streaming of digital files (including high definition up to 1080I) or internet media such as youtube directly to your TV via high speed LAN or 802.11 A/B/G connection as well as a HDMI output for connecting to your HD television. This UPnP digital player can stream all sorts of media including embedded internet content to your TV, and it does it with a wide selection of connection types, allowing you to choose what works best for your particular TV setup. How? Once the unit is configured to your home network either by LAN cable or WiFi, you simply connect it to your high definition TV / enhanced definition / standard definition TV via HDMI, component or composite cables. Simply a must have gadget for any AV setup, and available now to you at a fantastic Chinavasion only wholesale price. As always, this wonderful little product is offered to you with factory direct low china wholesale price . From the leader in the latest and greatest direct from China electronic products, Chinavasion. Works for hi-def and standard TV's with a variety of connection types, including HDMI. ordered on 14 Oct 2010 arrived via UPS on 18 Oct 2010. The product itself works 100% out of the box, a bit fiddly to set up, but it works no problem, Connects to my network no problem, I am using windows 7 Ultimate 64 bit. In my view a good purchase. it works and the image quality very pretty good. I can watch movies wirelessly from my pc in my office (second floor) to my tv room(1 floor). It worked for me in windows 7 until today. overrall recomended especially if you know your way through computers. i looks realy good but i am wondering if there is windows 7 drivers? Good high def product and really awsome features for your TV.